There are many different types of hair loss solutions all with their own unique methods and results. Each type also has varying degrees of effectiveness and permanency. The determining factors are the gender of the patient, the degree of hair loss the patient has experienced, and many other individual circumstances. Men and women alike should look at and discuss with their doctor all the options that are available to them before committing. Here is some information on the various hair replacement procedures, and their efficiency. Hair transplants are the most common method of hair replacement. It works by removing small portions of scalp that can grow hair, such as the side or back of the head, and then transplanting it to the areas of the head that are balding. Hair transplants provide extremely permanent results, and work for most of the patients that undergo this procedure. The downfall of hair transplants is that it is often expensive and requires more recovery time than other procedures. Scalp reduction is another one of the most effective hair loss solutions. In this surgery, the bald section of the scalp is removed. The doctor then sutures the skin with hair back together. Scalp reduction is often used in conjunction with hair transplants in order to create the most natural results and avoid obvious seams. Scalp reduction is a permanent solution because it is simply using the existing hair to make it appear that the bald patches never existed. However, for men or women with a greater area of baldness, scalp reduction cannot be performed alone. At the opposite end of the spectrum is scalp expansion surgery. This involves inserting silicone bags underneath the scalp to expand the skin with healthy, growing hair on it. After the silicone bags have prompted enough hair-growing skin to expand, the bald portions of the scalp are removed. This can be a permanent solution, but is not a quick procedure. It requires varying lengths of time depending on how much new hair-growing skin needs to be produced. Flap surgery is a much newer procedure. While it shows great potential, it is still under construction to perfect it for the most permanent results. This surgery involves taking a large portion of the scalp that is actively growing hair and detaching it only partially. This detached portion is used to cover the balding area while part of the flap is still attached to the original spot. This ensures that the blood vessels continue to send nourishment for maximum hair growth. What is unique about flap surgery is that the hair does not fall out as in hair grafting. Flap surgery, when done perfectly, is by far the most effective and quickest form of permanent hair replacement. 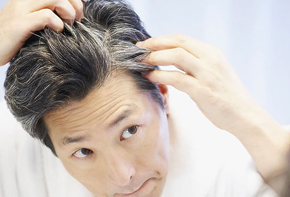 Many people look towards drugs and medications that can offer permanent hair restoration. Unfortunately, most of those available at the drug store, and even from the doctor, will not provide a permanent solution. The pills and topical creams may produce results for many men and women, but the results only work for as long as the product continues to be used. This is because they work like a steroid prompting growth in the roots. While they will thicken existing hair, they will not have much or any effect on patches that are entirely bald. While the surgical solutions may require more recovery time and out of pocket expense, they are the most permanent and effective methods of hair restoration. When performed under the guidance of an educated and trained physician, hair loss patients can regain a lost piece of their youth in a way that looks natural.